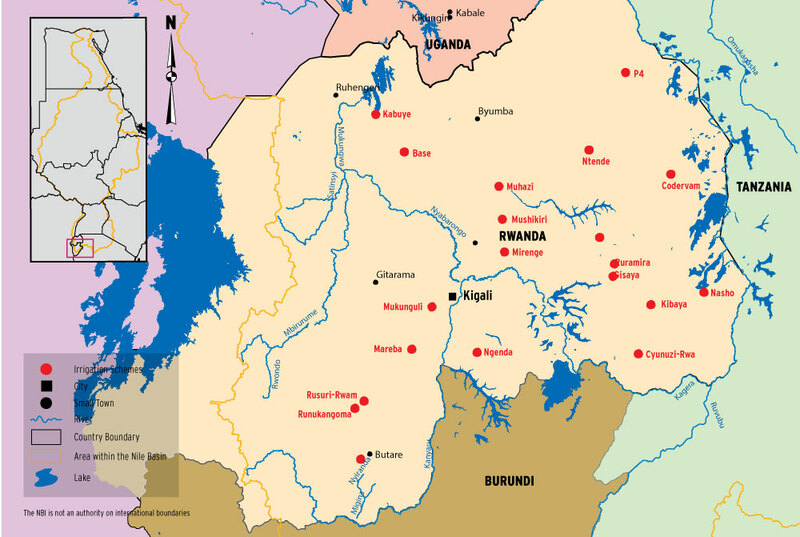 The total area equipped for irrigation in Rwanda is estimated at 11467 ha. With an estimated cropped area of 7000 ha, the overall cropping intensity is 61%. Main crop planted in most irrigation schemes is rice. The total estimated irrigation water demand for all schemes is about 58 MCM and actual abstraction estimates lie at 57.4 MCM, which indicates a volumetric demand satisfaction rate of about nearly 99.% Irrigation in Rwanda dates back to 1945 when the Belgians built the main Ntaruko – Rubengera canal with 8 km of length to irrigate a small farm. From 1962 to 1994, the total cultivated and irrigated lands were estimated to be 4000 ha. The major part of irrigated lands (8.3% of the estimated potential) are located is in the marsh lands that cover 164,947 ha with around 57% already cultivated with an estimated 11,467 ha currently managed with moderate irrigation structures (regulators, diversions, head works, etc.). Rice is an important crop and approximately 62,000 tons are produced annually on about 12,000 ha. Due to the retention of flood flows, the marshlands are important to downstream users as they maintain relatively continuous flow rates in the dry season.